The Cleveland Plain Dealer reports Cleveland outpacing Columbus. 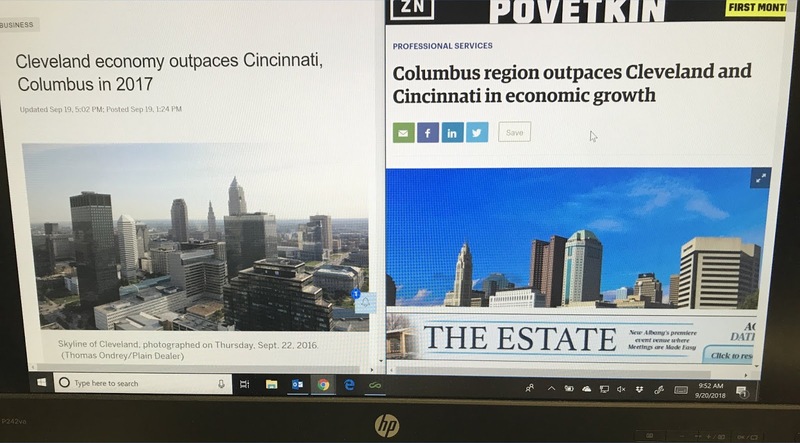 The Columbus Business First reports Columbus outpacing Cleveland. Manufacturers deserve credit. Though Business First fails to mention it, a deeper looks shows that higher than expected growth in manufacturing is why both Cleveland and Columbus areas saw growth. The 'Burbs deserve credit. Both cities are actually reporting metropolitan data. I've done the research before. Last year, 94% of manufacturing projects reported by Site Selection magazine, and consistently each year at a similar pace, are happening outside of the 3C's. The 3C's should thank the 'burbs (both suburbs and exurbs) for the pace of growth in their respecting metro areas.